This is a sponsored post written by me on behalf of Nature Nate's 100% Pure, Raw & Unfiltered Honey.. All opinions are 100% mine. 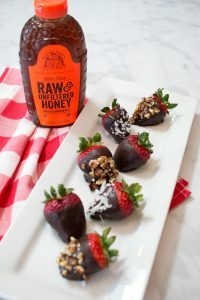 Learn how to make the best Chocolate-Covered Strawberries the easy way with this healthy recipe using coconut oil, cocoa powder, honey and vanilla! 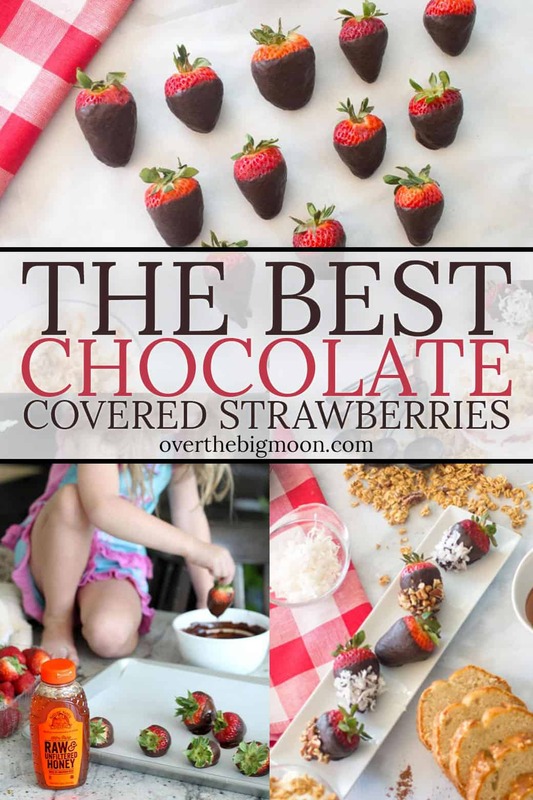 I’ve got a couple kiddos who have a crazy obsession with chocolate-covered strawberries! 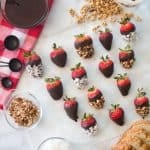 So, I find on Sunday when I’m making brunch, if I also make a batch of chocolate-covered strawberries then they’re extra excited to eat! 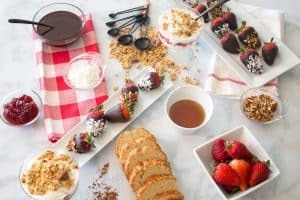 With summer here, we have some extra time in the morning, so the other day we decided to make a fun brunch! 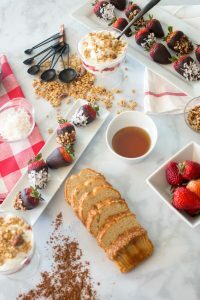 Breakfast is one of our favorite meals of the day, and so once a week I like to make something extra yummy! My kids always love getting into the kitchen and being a part of making snacks, but sometimes it can be challenging to have them all in there at the same time. 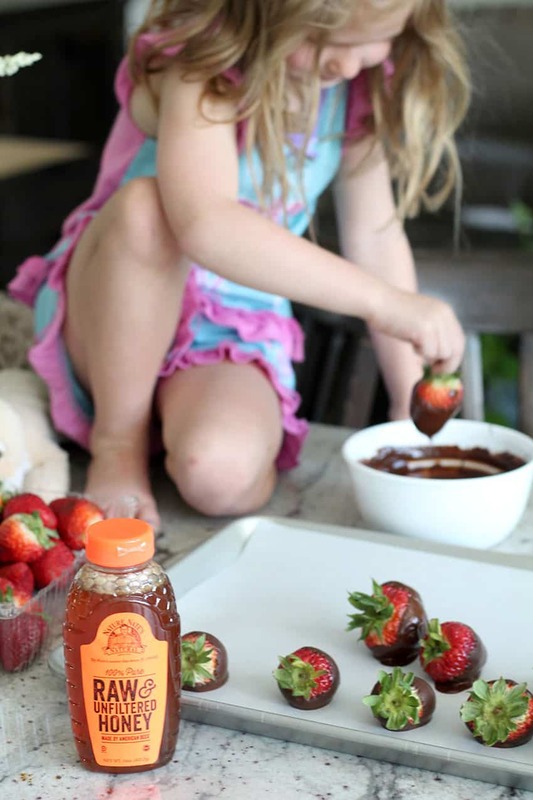 We decided to make chocolate-covered strawberries because it’s easy enough to have everyone help with it. I also made parfaits and Sour Cream Banana Bread! 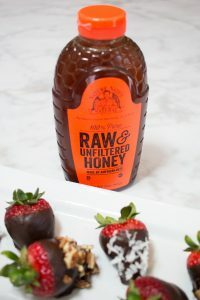 Using Nature Nate’s 100% Raw & Unfiltered Honey is a great way to ditch the processed sugar without compromising on taste! 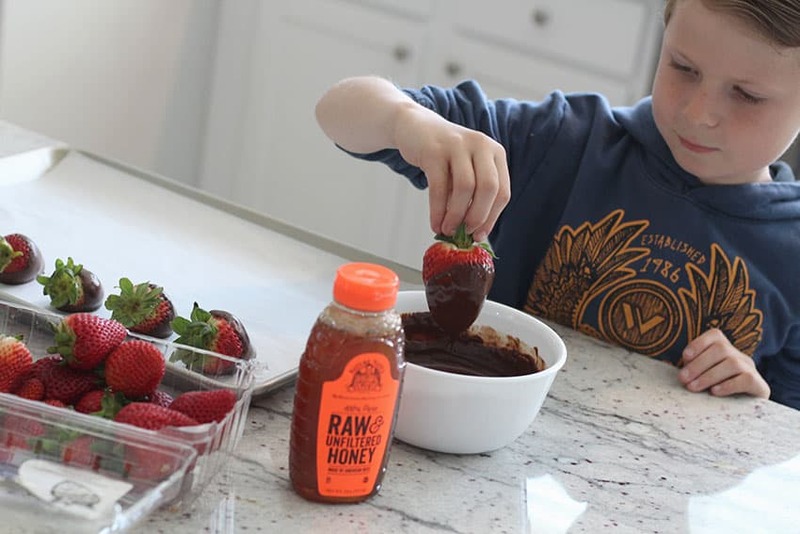 Another plus is that honey is sweeter than processed sugar – you can use less of it and still get the same depth of flavor and sweetness that your kids expect from their favorite foods! 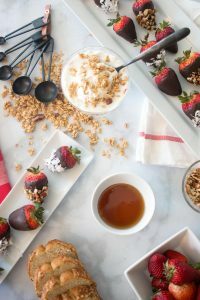 I typically have all of the ingredients on hand, which makes it super easy, and the recipe comes together in just a few minutes! 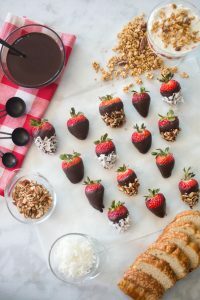 These delicious treats are also a fun one to throw together for an after-school snack, b-day parties, holiday parties or even just a dessert after dinner! 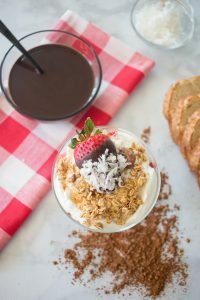 Add your chocolate-covered strawberries to a yogurt parfait with granola and you have a delicious brunch that everyone is sure to love!! Rinse strawberries in cold water and dry with a paper towel. If your coconut oil is solid, warm it in the microwave until it becomes a liquid. 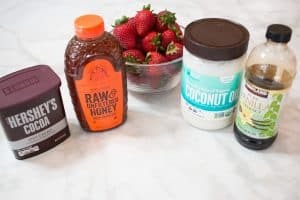 Pour the Nature Nate's Honey and the vanilla into the coconut oil and whisk until completely mixed. Slowly add the Cocoa to the oil mixture as you mix it. Stir the chocolate mixture until it is completely smooth. 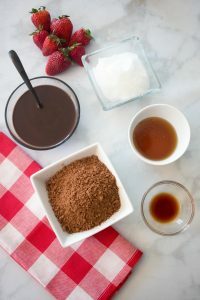 Add additional honey for an even sweeter tasting chocolate. For a thicker chocolate place it in the fridge for 5 minutes until it begins to thicken just a little bit. 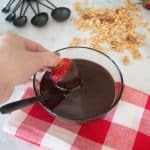 Stir the chocolate again before dipping. 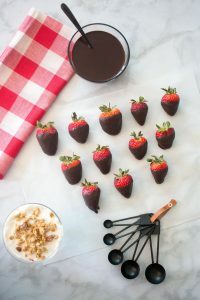 Hold the strawberry by the leaves and dip it into the chocolate and let it drip before placing it on the parchment paper to set. 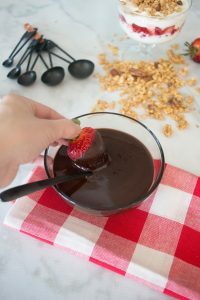 For a thicker chocolate layer, dip the strawberry in the chocolate again after a few minutes. 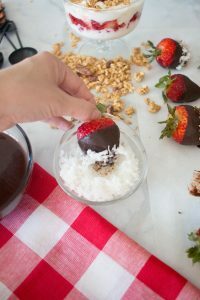 Optional: immediately sprinkle coconut flakes or chopped nuts onto the chocolate before it begins to set. Refrigerate until the chocolate is solid! I have talked to several of my friends about the whole “letting kids help in the kitchen” thing, and quite a few of them have expressed to me that they generally don’t let their kids help because it is too big of a mess, it’s hard, takes too long, etc. I TOTALLY UNDERSTAND! All those statements are true! But, I seriously challenge all of you to let your kids come and join you in the kitchen! For one, I think teaching kid’s skills in the kitchen is important, but more importantly just because they have a lot of fun!! I mean look at how hard he is concentrating! My middle child took the most pride in his strawberries! I hope you love this quick and easy recipe like my family does! Make sure to Find Nature Nate’s at a store near you! 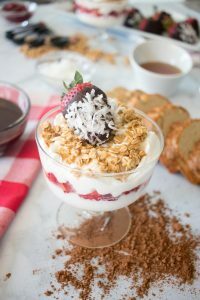 If you love this recipe, I’d love it if you wanted to pin the images below! Thanks!